‘It should be more trashy,’ says the protagonist at the beginning of Dario Argento’s seminal giallo, nailing the film’s gaudy colours firmly to the mast. A post Blow Up David Hemmings plays Marc Daly, the innocent, metro-sexual jazz pianist who witnesses a murder and so finds himself in a cat and mouse game with the deadly assassin. His attempts to unravel the mystery, aided by reporter Gianna Brezzi (an excellent Nicolodi), are hampered as each potential witness is hunted and slain and he himself becomes a target for the psycho-killer. The staple elements of the giallo genre are here: the lurid and elaborate murders; the killer’s black leather gloves; the POV camera that stalks the victims; and the cod psychology -’the killer could appear quite normal’ - further complicated by a dash of the paranormal (the first victim is a psychic who sees into the mind of the killer). The film’s trashiness, however, is willed. Marc will argue with Carlo, a friend and comrade in jazz, who accuses him of playing ‘bourgeois’ jazz, of basically slumming it in contrast to Carlo’s bitter, self-destructive and ‘proletarian’ jazz. The elaborateness of the killings are a case in point, as each one is meticulously set up, scored (both by the killer with a creepy children’s song and by the prog-rock group Goblin) and delivered while, at the same time, retaining a primal savagery and bloodiness. To emphasise the film’s stylistic schizophrenia, one character is killed by a combination of a dustbin lorry and a sports car. This duality is also evident in the film’s portrait of a deeply confused Italy: a country torn between its heritage past, its statuary and haunted villas, and a hankering after a tacky modernism, of which Marc himself, with his imported jazz, his sterile apartment and his local Edward Hopper-inspired bar, is a representative. It is a country where oafish policemen discuss strike action, munch on sandwiches at the crime scene, ogle prostitutes at the police station and appear blandly uninterested in the crimes taking place. In Argento’s Italy, the children are menacing, casually torturing animals, and the psychiatrist, Prof. Giordani, is as crazy as the case he seeks to analyse. This double disc DVD release offers a belated opportunity to see the original full-length film. This is not so much a director’s cut as a restoration of the 1975 Italian theatrical release. There is a bit more gore: the eponymous red has that wonderful sloshing paint quality that can only be found in 70s cinema. We also get more comedy as Argento tries for a Thin Man dynamic between Hemmings and Nicolodi. Any conventional sense of romance is eschewed, however, as Hemmings’s neurotic vulnerability renders him incapable of taking on the masterful Nicolodi, who, as a strong and independently-minded career girl, also serves Argento as a foil to possible charges of misogyny. 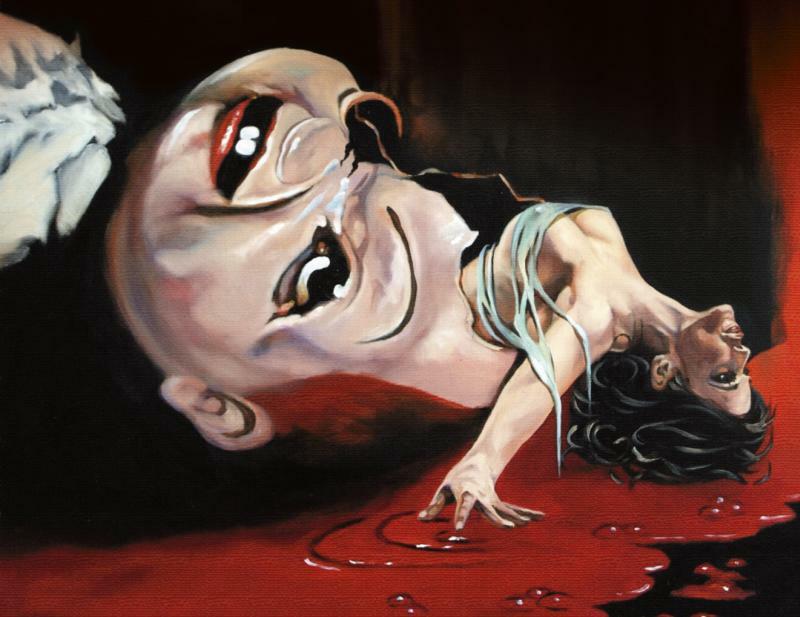 Take a look at our Dario Argento’s theme page.